Disaster Donate a dollar your contributions are very welcomed! The new 'Chicago Haunts 3' paranormal book is being called the best! Ursula Bielski continues her collection of ghastly ghosts in this third volume of Chicago Haunts. With the holiday season started and the search for a unique gift, one suggestion is a book that readers are calling the best Paranormal book about Chicago that has been written and is brand new. The book is 'Chicago Haunts 3', by Chicago paranormal author, Ms.Ursula Bielski. One reader who is well read on the subject of both the Chicago Paranormal and Chicago History by many authors, called Chicago Haunts 3 the best she has read and written in a unique new way by author Ms. Ursula Bielski as the paranormal information and history of all the locations come across in a way that it is like reading a story, the book could not be put down. Ms. Ursula Bielski may be the only well known Chicago paranormal author / Paranormal Investigator that actually lives in the city of Chicago and grew up in the city she writes about. Besides the 6 paranormal books she has now written, Ursula is the author of numerous scholarly articles exploring the links between history and the paranormal, including articles published in the International Journal of Parapsychology. Ursula is a past editor of PA News, the quarterly newsletter of the Parapsychological Association, a past president and board member of the Pi Gamma Chapter of Phi Alpha Theta, the national history honor society, and holds membership in the Society of Midland Authors. Ursula Bielski is the founder of Chicago Hauntings, Inc. and his been writing and lecturing about Chicago's supernatural folklore and the paranormal for nearly 20 years. Ursula is the author of six popular and critically-acclaimed books, including Chicago Haunts, the first-ever book to document the city's rich ghostlore, and is the organizer of the first Chicago Ghost Conference of 2007. 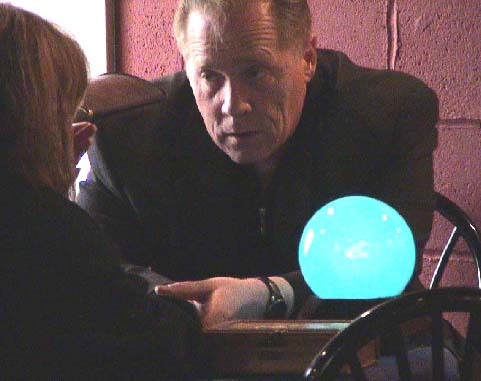 Ursula and her husband, author David Cowan, formed Chicago Hauntings, Tours in 2003, and the tours have emerged as the most respected and acclaimed in the city. Ursula she also hosts Beyond the Veil events with Chicago colleague Edward Shanahan of the Unexplained World, escorting guests to intensely spiritual locations around the Midwest. Ursula's interests in Chicago ghost hunting began at a young age. She grew up in a haunted house near Wrigley Field on Chicago's north side and received an early education in Chicago history from her father, a Chicago police officer, who introduced Ursula to the ghosts of Graceland Cemetery, Lake Michigan and the old lockup at Chicago's storied Maxwell Street Police Station. Since that time Ursula has been involved in countless investigations of haunted sites in Chicago and around the nation, and has appeared in productions by the A&E Network, The History Channel, The Learning Channel, The Travel Channel, and PBS. In addition to her books, Ursula is the author of numerous scholarly articles exploring the links between history and the paranormal, including articles published in the International Journal of Parapsychology. Ursula is a past editor of PA News, the quarterly newsletter of the Parapsychological Association, a past president and board member of the Pi Gamma Chapter of Phi Alpha Theta, the national history honor society, and holds membership in the Society of Midland Authors. Ursula holds a B.A. degree in history from Benedictine University and an M.A. in American cultural and intellectual history from Northeastern Illinois University, where her academic explorations include the Spiritualist movement of the 19th century and its transformation into psychical research and parapsychology, and the relationships among belief, experience, science, and religion. Spiritual Observer - Psychic Reader - Paranormalist - Chicago land area. Chicago land area and also is involved in group tours of paranormallocations. I’LL BE HOME FOR CHRISTMAS . . . HAUNTED BY HOLIDAY GHOSTS!